Shedding light on the often overlooked in college libraries, Olivia Bonsall gives us a glimpse into Sara Rawlinson’s enlightening new exhibition. Why attend an exhibition about places which we visit every day, spending hours on end agonising over our latest essay crisis? When walking into Sara Rawlinson’s Illuminating Cambridge Libraries, the exhibition instantly fulfils what its title promises – it casts a new light on college libraries. On entering the Heong gallery, a perfect, spacious setting for Rawlinson’s work, an entire wall dedicated to close-up shots of library details, from book spines to crests, from keyholes to cracks in the ceiling, stands out to me. 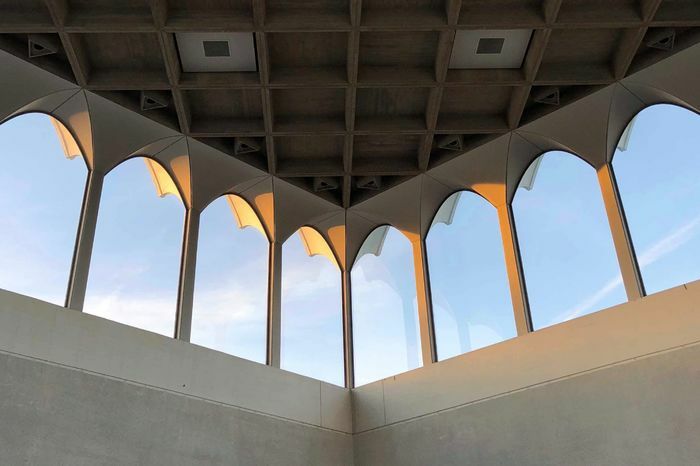 The light and dark contrasts, as well as the contrasts between old and new libraries, encourage us to contemplate them with all our senses, something which we often fail to do in the everyday hustle and bustle of Cambridge life. Rawlinson, who has lived in Cambridge for two years, already holds permanent displays of her photographs in Cambridge University Press Bookshop and Indigo Café, and has temporary exhibitions lined up for 2019. Previously working in academic science, she has now gone back to her roots as a photographer, inspired by her childhood experimenting in her grandmother’s darkroom, in Minneapolis, Minnesota. In her current exhibition, which features 26 out of the 31 college libraries, she aims to “enable the dissemination and preservation of knowledge by highlighting the aesthetic environment in which books and documents are displayed and preserved”. The layout of the room encapsulates this objective remarkably, the photographs grouped into The Walls of Windows, Texture, Stairs, and Rooms, each highlighting a different angle from which to view our libraries. I was lucky to meet Rawlinson herself, who shared my preference for a photograph of the spiral staircase in Fitzwilliam College’s Olisa Library, featured on her Wall of Stairs. She expressed that this collection was “the most fun” to photograph, as she allowed herself to play with stripes and lines, framing stairs in unexpected and cryptic ways. The photograph, taken from the bottom of the staircase and positioned next to shots of Downing and Trinity libraries taken from the same angle, draws us into the circular motion of the staircase, although the stairs themselves or their surroundings are not visible in the shot. The bright white light in the centre of the photograph indicates the destination that we wish to attain when climbing the stairs. The simplicity and space evoked in the shot leaves us to contemplate, in Rawlinson’s own words: “Will our journey be dizzying or tiring? Are our footsteps likely to be noisy or quiet? Will we meet with disappointment at seeing someone else already in our favourite seat?” These are all questions which we can ask ourselves when we next explore a library, whether or not we have visited it before. Another piece which caught my eye was a photograph of Robinson College Library, which requires careful observation to understand the angling of the shot. Combining warm oranges and cool blues, this piece creates a welcoming atmosphere, highlighted by lines on either side of what we will eventually realise is a ceiling, which draw us into the centre of the shot. The idea behind the “Wall of Windows” pieces is that they represent fresh thought and a fresh viewpoint, and I think the angling and framing of the shot reflect this beautifully. Without stitching images together, or any highly manipulative editing, Rawlinson creates a piece which we cannot understand at first – what exactly are we looking at? Indeed, it was not until a former Robinson student told me that we were looking up at the ceiling, between beams and walls, that I realised where the picture was taken from. This appeared to be a favourite among attendees, and I would recommend that you go and take a look at it for yourself. The opening night also included readings by local poet, Michael Brown, who had written them in Pembroke library during his time there. They can be found in the exhibition guide as you enter the gallery, and serve to illustrate the creativity that library atmospheres inspire. As stated by Rawlinson, the poems reconstruct the quintessential Cambridge that we know, unifying everyday details of life in the historic city, much like the combination of textures in her Wall of Textures. The amalgamation of visual and literary arts, of the old and the new, is refreshing. 17th century borrowed lecterns from the Wren library, Trinity college, both add an interactive element to the exhibition, inviting us to gently twirl them around, and display Rawlinson’s photographs of book spines, whose intricate details allow us to ponder about what is inside. And, for the artistically inclined, make sure to use the spotting scope, which allows you to observe the shots in more detail, to then sketch them on a provided easel and paper. Illuminating Cambridge Libraries pushed me to view college libraries a little differently. I’m sure I will spend more time wondering about their history, their atmosphere and their ability to inspire a thirst for knowledge next time I visit one. The near-objectivity of Rawlinson’s photographs, which, for the most part, have only been edited in terms of exposure, saturation and contrast, creates a new accessibility to Cambridge university life, for those who do not study here. The focus on details demystifies their grandeur, and renders them less intimidating, while the long shots of libraries allow us to understand the true atmosphere of a Cambridge college. This exhibition is a necessary step in reducing the “town and gown” gap, as it is open to all, and integrates anyone who wishes to see it into life at the University of Cambridge. Illuminating Cambridge Libraries is running from the 11th-17th of February 2019 at the Heong Gallery, Downing College. Spare an hour out of the library to stop and reflect on its beauty, its history.